Who writes movies like Mega Shark Vs. Mecha Shark? For every high-minded HBO drama or Oscar-winning screenplay, there’s a poorly scripted faux-reality show or a Sharknado, and screenwriters are responsible for penning all that material, from the brilliant to the ludicrous. Though it’s hard to recognize this fact during awards season, it’s the writers churning out mass-market material who are responsible for most of what we consume. Jose Prendes is one of those writers. 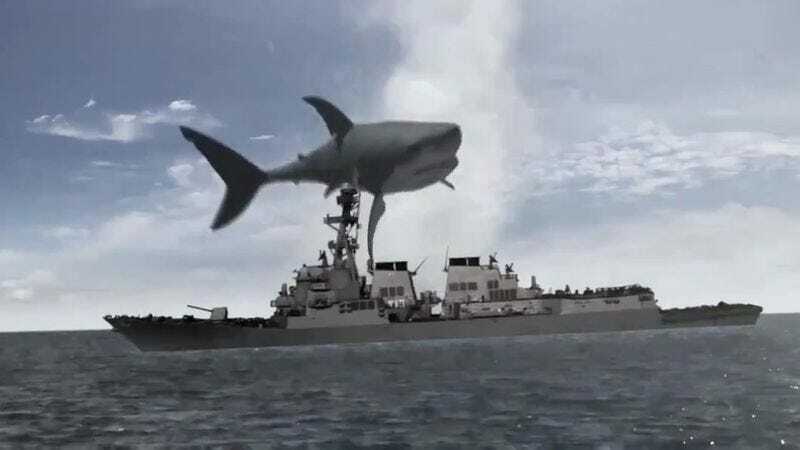 He’s written 10 movies that have gone to production, including The Asylum’s new Mega Shark Vs. Mecha Shark, now available on DVD. The Debbie Gibson vehicle is true to the production house’s trend of total camp, yet—despite scenes like the one where the Mega Shark crushes the Sphinx—it still had to be written with production knowledge and plot sensibility in mind. The A.V. Club talked to Prendes about his role in the film, and just what it takes to write something so silly. The A.V. Club: How did you get into screenwriting? Jose Prendes: I’ve always loved movies. I was an only child, so movies and books became my brother and sister. I was going through a lot when I was younger, so for me the escape was necessary. I loved disappearing into this world. I could put anything in the VCR, or open any book, and just vanish. To this day, I believe there is magic, and that magic is movies and drawings and books. I discovered early there was a real power to that, and I wanted to be a part of it. I really found my love for writing around seventh grade. We would do short stories. We had to read them out loud in class, so I would make them funny and the kids would laugh and I guess I got addicted to that power, having them enjoy what I created. I decided early on that movies were going to be my thing. I taught myself how to write scripts. I just picked up books—and this is what I recommend to anyone that wants to be a screenwriter: Just go out and read scripts, get screenwriting books, learn the format, understand all that stuff, like first, second, and third acts, hooks, all that kind of mumbo jumbo and formatting and stuff. It’s the hard part of writing, all the technical stuff. Once you’ve ingrained that into your muscle memory, then you can open up and be a screenwriter and write whatever you want. That’s when you basically have the wizard’s bag and can do whatever you want with it. Writing movies also takes way less time than writing a book, so that’s the thing I did the most. AVC: When people think “screenwriter,” they might be thinking of the people who pen Oscar classics and high-minded dramas. How did you get into writing campier projects, like Mega Shark Vs. Mecha Shark? JP: It’s always been hard making movies, especially when you don’t have a track record. It’s really difficult to get the big-time jobs, or the big-time recognition. When you move to Los Angeles, there are thousands of guys just like you who can write a script just as fast and are just as talented, and everyone is scrambling up the mountain to get bigger and better jobs. I’ve got a 5-year-old and a wife that I want to support, so I need a job, and I happen to be connected to The Asylum, who made Mega Shark. They distributed my second movie, ﻿Corpses Are Forever,﻿ which was “James Bond meets zombies,” and then I directed something for them two years ago called The Haunting Of Whaley House, which I was really proud of. Around the time that Sharknado was about to be released, they said, “Well, we’re making Mega Shark, would you be interested?” To be honest, at first I wasn’t, because there’s a stigma attached to these kind of movies. And, honestly, no matter how great your script is or how interesting your characters are or how big the action set pieces are in your movie or your script, they won’t translate that well to the low-budget world. That’s the reality of making that kind of a movie with limited resources. Anyway, I was hesitant at first, but then Sharknado took off and I thought, “Well, okay, great. Maybe now they will be a little more open to having some fun with it instead of taking it so dead serious.” I’ll agree that’s a drawback to some of these movies: They’re taken too seriously. Now that they see that people had fun with it and seemed to like the joyful aspect of it, maybe we can branch out and have a good time with it. I jumped on because I thought it would be a fun exercise. For the most part, it was. Luckily the director, Emile Smith, was on board as well. He certainly didn’t want to make a serious drama that just happened to have a giant shark in it. It definitely became more than we originally thought it would be. AVC: What’s the actual process of writing something like Mega Shark like? Do you get an outline? Do you pitch the idea? JP: It’s funny because they ask you for an outline. So in my mind, I go, “Well, how would I make this movie?” The number one question is, “How do I make this organic?” How does the government go, “You know what we need? A giant metal shark to take this guy out.” That’s obviously a big leap, so my job is to make that work. But then, of course, one of the biggest early notes I got was, “Oh, by the way, in the beginning of the movie, the Mega Shark escapes and he’s got to destroy the Sphinx.” And I’m like, “Wait. Do you mean the Sphinx in Egypt?” “Yeah, he’s got to destroy that somehow.” So they give you these weird things that you have to put in. It’s obviously played as a laugh, because there’s no way you can do that seriously. Also, in my opinion, if I can’t write the people I’m thinking about, then I’m just writing cardboard characters, and that’s not interesting to me. So, a lot of my fight with the pre-production side was like, “Well, can we do this kind of dialogue so that they don’t sound like robots? Can we add this? Can we just do a little bit over here?” Once you get it down on the page, you realize you’re not writing 12 Years A Slave. You’re writing a movie about two giant sharks. At the end of the day, I’m glad the director and I were on the same page. A lot of that real heavy character stuff stayed in there, which is nice. AVC: Was there ever a point in the writing where you said, “I just don’t see how I’m going to make this shark destroy the Sphinx?” How did you get your head around the premise? JP: Mecha Shark has been on the table for a while, actually. They always wanted to make a Mecha Shark movie. It was just finding the right time to do it. That’s always been part three, and I don’t know what part four is. I don’t even know if part four is going to happen. But part three, Mecha, has always been there. They came to me and said, “Look, we want to do Mega Shark and he’s going to fight a Mecha. We want this and this to happen and then you tell us what that movie is.” Then it begins a back-and-forth process with the development people. You’d be surprised how precious The Asylum is about their scripts. Not to knock them, but you would think you’d turn in one draft and that’s it, but I did nine drafts of Mecha Shark, which is not something I was planning to do. There were so many notes coming in. I also didn’t want to write something I knew production couldn’t do, because it’s hard enough to make these movies. I try to come up with a movie that was close to what producers wanted, but then something that I would want to see as well. Things change a lot along the way. There’s a character that was in Mecha that I really love, but they didn’t like, so I decided to incorporate it somewhere else, and it went in my book. If they tell you, “You have to destroy the Sphinx,” I’ll tell them, “You know, that’s probably going to look retarded.” Then they’ll tell me, “Just try it, just do it.” That’s what they want to see. So you find a way to make the Mega knock a tugboat out of the harbor of Alexandria and have this tugboat fly through the air and hit this target seven or 10 miles away, or whatever it is. And that’s the opening of our movie. In a way it’s kind of good, because I think people get the idea that, “Okay, this is going to be a fun one.” That’s sort of the spirit I embrace with it. Let’s have fun with it. Originally a lot of the notes were like, “Can we have more people crying, because the world is in jeopardy?” I just don’t know that people would really be crying about a giant shark, but that’s part of the battle. The producers want a certain movie. Sadly, the writers are usually the whipping boys, or girls. You just try to connect the pieces in as logical a way as possible. AVC: How long did it take to write the movie? Even with all the drafts? JP: I write incredibly fast, so I believe the first draft was done in about four days. The fun part about Asylum is that they say, “Oh, we’re making this movie.” I go, “Oh, okay, great.” “Yeah, we’re shooting in two months, and we need the script.” It’s definitely a rush. I guess not always, but it seems like I get all the rush jobs, because they know I write fast. So, let’s say about a week for the first draft, and then I was writing up until they were shooting. All in all, probably about two months, or something like that. After that, I just told the director, “Look man, make it work. If you have to change something, change something. Don’t be married to it. If you have to add things, go ahead.” It happens sometimes. You have a script that’s either too long or too short, and you can’t cover everything in a shooting day, or you miss a couple dialogue scenes here and there. You end up coming up short in the editing room. Then you have to shoot extra scenes to fill the gap. They did it in this movie. I think if you watch the movie you can tell which ones are the filler scenes, but I get it. It happens. AVC: You said you keep budget in mind. How do you know what’s possible and what’s not, or how much an idea you have might cost? JP: In the first draft, I was really conscious about that, because I’ve directed, so I understand production issues and things like that. But I gave them a big, epic movie, because that’s what they wanted. They wanted something huge. They always want some Jerry Bruckheimer- or Michael Bay-type of thing. But obviously resources aren’t there to really pull that off, which is unfortunate. They always give you a limited number of visual effects to keep in mind. For this script, I only had 100 VFX shots, which means whenever we saw Mega or Mecha, that would be a VFX shot. They kept asking me to cut character stuff and have more action, because action means VFX, but it got to a point where I was like, “Okay, fine, you want effects? You want big, epic action? I’ll give you the craziest third act I can dream up.” Luckily, we got close to shooting that ending. It wasn’t exactly the third act that I wrote, but it’s close enough. It still has that fun ’80s action movie feel, which I always aspire to. That’s always my template, stuff like Die Hard and Lethal Weapon. I love that stuff. But yeah, they always say, “We want bigger, we want bigger, we want more destruction, we want to see that submarine crew being destroyed.” But then in my head I’m like, “Submarine crew? That means we need a submarine set and we need to hire submarine actors,” and it’s hard for me to write that stuff, because I know production is going to be boned at the day. But you try to appease the producers. Then, once production starts, you let the director figure it out. Luckily, he was really great. He was very game. It was his first movie, too. I’m actually really impressed by him. AVC: Do you know what the budget on Mega Shark Vs. Mecha Shark was? JP: I don’t. I never got an official number, but I know way lower than Sharknado. AVC: And much lower than Pacific Rim, let’s say. JP: Oh yes. [Laughs.] Yes. AVC: Do you do research before writing? JP: Like I said, The Asylum is very precious. They love military speak and they love that kind of techno babble stuff. I don’t like writing that way, because I think it just feels robotic and inorganic and not human, so I try to find that happy medium. I actually did a lot of research into megalodon feeding habits and mating habits and whatever research there has been on megalodon and sharks in general. I studied submarines, missiles, that kind of stuff. I actually did a lot so that when people are talking, it isn’t, “Oh yes, we used the flux capacitor to open the jibby jab.” It all sounds real, kind of. And it is. It’s all sort of based on reality—especially the opening scene in Egypt when it’s a tugboat bringing in the iceberg that just happens to have the Mega in it. That’s actually real. They do that. When there are droughts, they’ll bring icebergs into drought areas to help relieve it. JP: Yeah. I don’t know if I mention it in the commentary. I should have. It’s real. It’s a real thing. AVC: Did you use the same research for your new book, Sharcano? JP: Sharcano came out of me wanting to have no rules, no notes, no budget to worry about, no VFX to worry about. I’ve always been a shark fan. Jaws is one of my favorite movies. I’m scared of sharks, but that’s what I like about them. There’s something so interesting and primal about them. So, writing Mega, I really wanted to cut loose and go crazy with it. I pitched the idea to Curiosity Quills Press, a great publishing house, and they loved it. A lot of the stuff that I didn’t use in Mecha, I put in Sharcano. In a novel, you can be Jerry Bruckheimer; you can do the Michael Bay thing. I did a lot of research, especially because it’s sort of international. I wanted to make sure that when I was talking about places I knew at least the names of things and what they look like and all that good stuff. AVC: I bet the Internet makes a lot of that easier than it used to be 20 years ago. JP: Oh, yeah. I literally just Google stuff. Google is the best thing in the world. AVC: Do you have any idea how long it took to shoot Mega Shark Vs. Mecha Shark? JP: I think it had 15 days of principal photography, and then it might have had a couple days of reshoots. I was really only on set for one day. I have a brief cameo in the crowd. It’s hard to make a big movie like that in such a limited amount of time. But I think at the end of the day, it’s a really fun movie. I hope people see it. Don’t take it too seriously, obviously, but just sit back and enjoy the ride. I think it’s definitely built for people to enjoy it instead of mock it, which unfortunately happens. Same thing with the book. It’s out now on Amazon for Kindle and Nook and if you go to CuriosityQuills.com you can pick up a paper copy. Hopefully we’ll be in Barnes And Noble really soon. Sharcano is more for the bookworms, but if anybody wanted to see what Mecha Shark or Sharknado would be like with an epic scope and unlimited everything, it’s definitely the best example of that. It’s part one of a trilogy. I call it Sharkpocalypse Trilogy, and the second book will be out at the end of the year. I hope people stick around and enjoy the other books.